This is a fantastic opportunity to treat your hubby/spouse/self on Fathers day. 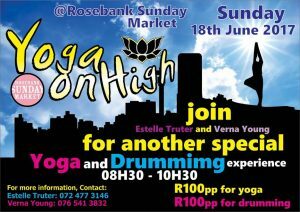 We’ll start with 60 min yoga on the rooftop, and then a 60 min drumming circle inside the market. The drumming circle is for beginners, even I can do it. If you’ve always wanted to do it, now is your chance. There will also be lots of other activities at the market on that day, like live music and live radio broadcast. The sorbet man will also be there, and lots of other fun things to do and buy.